Teng Xi is mentally handicapped. He has stayed in Taicang Sino-German Handicapped Technology Co., Ltd. (“Sino-German Handicapped Technology”) in Jiangsu for three year and it was his first time to assembly exhaust fan. The trainer spent about half an hour telling him to assemble the fan plate, inserted link, porcelain, etc. into a fan unit. And the final step was to install the “antenna” of the conical spring. After work, Teng Xi sent four working photos to the circle of friends on Weichat and said “trainer let me do a new job.” In Sino-German Handicapped Technology Company, Teng Xi has twenty colleagues with mentally disabilities. 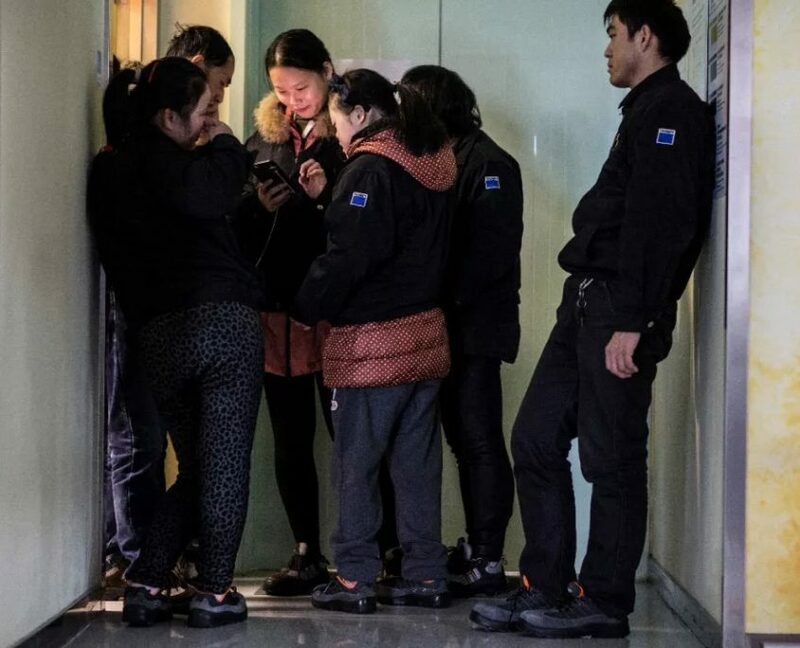 They work less than 7 hours a day, have a monthly salary of more than 1800 yuan, and enjoy social insurance, housing fund, weekends and statutory holidays. Sino-German Handicapped Technology Company is a welfare factory for the disabled, founded in March 2015 based on the employment pattern of the mentally disabled in Germany by German-funded member companies of Taicang European Business Investment Association. Currently, there are 21 assembly workers, all of whom are mentally handicapped, engaged in the processing and assembly of industrial parts. After recruited, the mentally handicapped will receive a two-week training, then start with the simplest screw cap nut and gradually learn more complicated operations. The trainer will allocate work for each employee according to their abilities, and try to allocate them with different contents in each shift, instead of only doing mechanical repetitive work. In addition to works on the assembly line, the staff also assumes the duties of “safety assistant” and “power-saving administrator”, and inspects fire-fighting equipment and switch electric gates every day. Some employees do not have the concept of time, but these works require regular checks and records, so they begin to learn slowly. This model is originated from Germany in more than 50 years ago. In 1960, an Organization for the Parents of the Mentally Handicapped in Lebenshilfe was established in Germany, a similar model that provides employment opportunities for the disabilities. At present, the plant of Sino-German Handicapped Technology Company is provided free of charge by the local Disabled Person’s Federation. German Investment and Development Co., Ltd. provides 50% of the project’s operating expenses for the first three years. Orders are from foreign companies in Taicang and surrounding areas. With the steady increase of orders, the Company hopes to expand its enrollment and even extend this model to other cities so as to provide more employment opportunities for more people with mental disabilities. In late January 2018, it snowed for three days in Taicang. Local people said the last time for snow as big as this time was in 2008 when Teng Xi moved to Taicang from Shandong with his parents. Teng Xi was born in Tai’an, Shandong Province in October 1991, and suffered a prolonged fever of 20 days shortly after his first month of life, left with the aftermath of mental handicap. In Tai’an, he studied in an ordinary school, but only attended class, no exam. At the second year, he refused to go to school. However, he was too young to work, his father found a football school where he could take classes in the morning and play football on the afternoon. Teng Xi studied at the football school for several years, and later moved to Taicang with his family because of his father’s business. When he arrived Taicang, he received a cleansing job through the Disabled Person’s Federation, just sweeping the yard, through which he could earn 1,000 a month. He did this joy for almost four years. His father’s death changed the life of the whole family. In the second half of 2013, his mother, Li Suyun, took him and his sister back to Tai’an, and contracted a newsstand where he could sell newspapers, cold drinks and mobile recharge cards. In 2015, they returned to Taicang. His little sister went to school and he worked at Sino-German Handicapped Technology Company. Li Suyun had a part-time joy which barely maintained their livelihood. 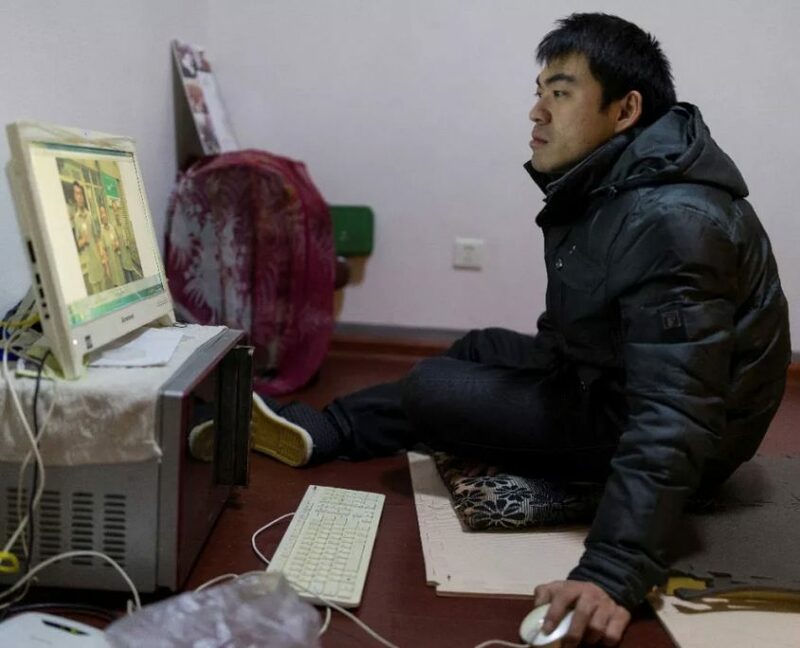 The family rented an apartment with two bedrooms and one living room in the southern suburbs, more than 10 kilometers from Taicang Software Park where Sino-German Handicapped Technology Company is located. After work, the Company’s shuttle bus would take him to the bus station where he could take one-hour bus to home. Teng Xi would cook by himself when Li Suyun was not at home. The mother also hoped that he would learn to cook and lived independently. “If one day I die, what do you do? You have to learn for yourself.” Since the elementary school, Tengxi went to school on his own, they never sent or picked up, because they wanted to cultivate his self-care ability. Now, except cook, Tengxi can count on his own in daily life. From the very beginning, Li Suyun has been encouraging him to go outside. As he grew up, she began to worry that he was “too independent”. He learned how to use computer and bought a smart phone for himself, which greatly widened the scope of his “out of the house”. “Sometimes he would get confused” and go to Shanghai and Beijing himself, or go to his hometown in Shangdong because he missed his grandmother and aunts. He went away on the spur of the moment and then told his mother. Li Suyun discovered that he was very sensitive to the names of the places. He could remember clearly how to go one place to another as long as he had been there. Most of the photos taken by Tengxi were the names of the places marked on the bus station and the subway. After several trips to Beijing, Tengxi lost two cameras. On one occasion, he had no money, so he contacted the family to pick him up. What really worried her was his safety instead of losing things. A warning from Sino-German Handicapped Technology Company was pasted at his bedside to “remind myself” at every moment. In last November, he returned to Tai’an without asking for leave beforehand, was recorded for two-day absenteeism and issued a warning. In Sino-German Handicapped Technology Company, employees have strict working hours and attendance. They must take leave in advance if they get sick or engaged. “Employees must understand that this is not a daycare” Marina said. Li Suyun felt that after working here, Teng Xi became more outgoing. Every day he would tell her about his work when he went home, for example, how many people came to his company today, where did they visit, he attended activities after lunch, etc. Sometimes she couldn’t wait and told her on WeChat at noon. Teng Xi likes to take photos and will be very active in taking photos with people if there is any visit and media interview. Marina said that he was the company’s “star.” Now, Teng Xi can get more than 1600 wages each month. In addition to the monthly living expenses of 500 for his younger sisters, he would save the rest for “marrying a wife”. “It’s enough for 100,000 or so I suppose, so I have to work until 2028″ said Teng Xi. After dinner, Teng Xi would go to bed at half past eight, have to get up at five o’clock on the next day to catch the bus at 6:15, and wait for the company’s shuttle bus at 7:10. On the morning of January 26th, he arrived at the shuttle point in advance when the snow was still falling, so he walked around the station to get warm. There was a snowman on the roadside wearing a red hat and a purple bow, with two purple grapes as eyes. He took a picture and sent it to a circle of friends on Wechat. Upon seeing the snowman sent by Teng Xi, Marina gave him thumbs up. At 8:30 in the morning, employees would do morning exercises together. There was one staff standing still and whispering, Marina moved over to her with the music, she ran away with a laugh, and Marina laughed and chased her. Marina knows every employee’s situation. For those people who did not want to say a word when they just arrived, but would describe their daily work endlessly when their parents came to visit, Marina would try to get her to speak with herself in a word every day. There is a young girl who especially likes to make herself up. She often wears skirts and high heels to go to work in the summer, and uses different types of hairpins every day. If her hairpins get askew, she will put them back to right position. However, she is more inclined to get cold due to Down’s syndrome, and she needs somebody to remind her of running at the nose. Some employees would smash the table if they were not happy, but refuse to talk. At that time, Marina would asked several questions in succession, like “are you unwell? Don’t you do this job? Is the food not tasty?” If getting a negative feedback, she would know that they became unhappy because of weather change. When Sino-German Handicapped Technology Company recruits employees, only Disability Certificate and Taicang account are required. After a two-week training, there will be a simple interview to understand the basic situation and understand whether they could carry out daily communication, and then they will be hired. Marina said that the company won’t consider their ability when hiring the disabilities, no matter how capable, they can develop slowly. 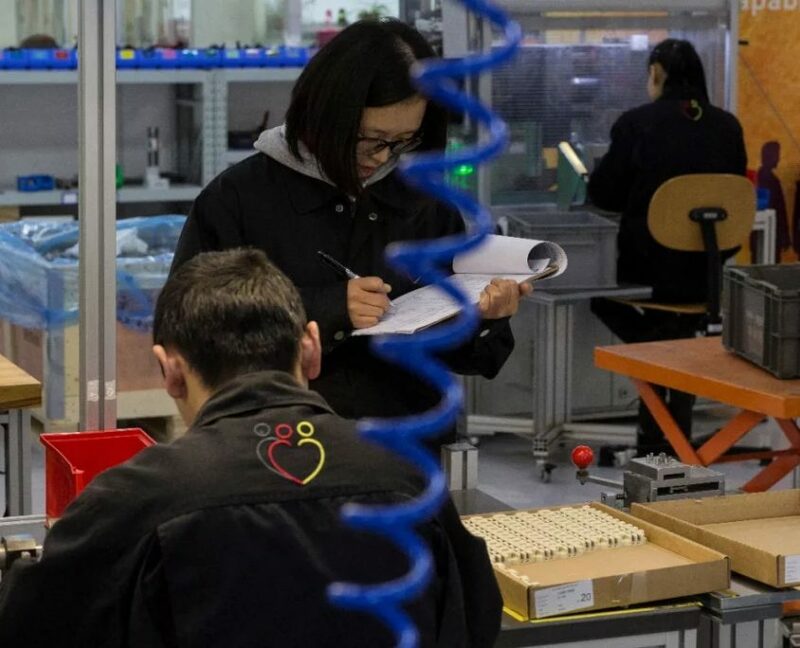 The factory is located in Taicang Software Park, with spacious and bright work space, colorful decoration and work tools, like an assembly line in the kindergarten. The ground is divided into working areas and pedestrian walkway by yellow paint. After entering the door, it is the work area. Walking along the walkway, there are two monitors, one is the employee’s attendance and division of work on the day, and the other is the picture collage of all employee. On the division table, each person’s name is represented by a different background, and the names of the employees who have weak sight are bold and darkening. Before the start of each shift, employees need to find their name on the division table, and then find the corresponding station for work. There is a white board marking production progress of production on the left side of the screen. After work, the trainer will schedule the next day’s production plan and division of labor according to the progress of the day and the capabilities of each employee. On one hand, daily planning will be arranged according to the dynamic evaluation of employees’ abilities and production status; on the other hand, it is required to develop employees’ working ability based on the production requirements and the operation capabilities. Trainers are the most critical part of this complex system. The role of trainers is more than that. Wang Xia, the manager of the production line, and Ren Wenhai, an employee, had a quarrel due to a pair of scissors. Wei Xintong brought them into the lounge and tried to communicate with them. It is a routine procedure when employees have behavior problems. But in less than a minute, Ren Wenhai suddenly burst into tears. Marina went in and let Wang Xia come out first. “The yellow scissor is oily, the black one is oil-free, and you have to use this one, not that one…” Wang Xia whispered in a sobbing tone. In the lounge, Ren Wenhai cried out and jumped up from the stool. After three consecutive times, he held the tissue paper that Wei Xintong gavn him, stood up, walked up to the trash can and threw it into the trash can. Then he squatted on the ground crying for about a minute, his voice gradually became smaller and he stopped. Marina walked over, squatted beside him and talked to him. After five minutes, they stood up and returned to the table. Marina asked Ren Wenhai to write on a paper, common way of communication between trainers and the mentally handicapped. About half an hour later, Ren Wenhai walked out of the lounge, laughed and trotted back to the production line. Marina said that people with mental disabilities were very sensitive to the changes outside, thus, sometimes there were emotional or behavioral problems. In fact, Wang Xia was not against him, but he would think that Wang Xia was against him. It is trainers’ daily work to pay attention to employees’ emotions and behaviors and guide their work. For a long time, they would know clearly that some employees need special attention every season and can easily tell whether they are happy from their behaviors and expressions. This is a training on social life. Marina and colleagues have set up various situations for employees to develop their ability of communication, self-care, and expression. Some employees who are reluctant to speak will be encouraged to write down or use WeChat; some employees are reluctant to communicate directly with each other, so Marina becomes a “voice tube”. She encourages them to change their communication methods; they are no longer provided with disposable cutlery but required to wash by themselves; one theme will be set every week for everyone to vote, just putting e a smiley or crying face pattern into the suggestion box. At noon on January 26th, the trainer brought the staff to the party building activity center next door. There were table tennis, billiards, fitness equipment, and tables and chairs to sit and chat. Snowing has become a hot topic. Liu Wei mentioned her four-year-old daughter: “Yesterday, I took her to the balcony watching snowing and asked if she would go down and make a snowman. She said no. I made a small snowman on the window. She saw and asked, “Mom, why doesn’t he have a carrot nose?”” Everyone laughed. After that, Marina took them to shop at the supermarket where someone understood the meaning of money and shopping for the first time. The idea of building a factory for the disabilities came across in 2013. Shen Ya is a member of the board of directors of Sino-German Handicapped Technology Company, and also the general manager of Living Water (Taicang) Co., Ltd, wholy-funded by Germany. In 2013, as one of the initiators, she witnessed the foundation of Sino-German Handicapped Technology Company. In 2008, she donated a school in Wenchuan, but later found that the school was left unused. Later, she discussed with several German business owners, decided to invest CSR (corporate social responsibility) projects in local and carried out localization experiments in Taicang of the welfare factory for German disabled people. This experiment was launched in 2014 under the promotion of the Taicang European Business Investment Association. German-funded enterprises under the Taicang European Business Investment Association have provided supports in terms of orders, equipment, uniforms and lunches for Sino-German Handicapped Technology Company. In November 2014, Veronica, a trainer from Germany, carried out the training for the first batches of employees and in March 2015, Sino-German Handicapped Technology Company officially opened. Marina’s experience of working with the mental disabilities started more than a decade ago. She was born in Israel and served in the military when she was 18. In the military hospital, she met a mentally handicapped person for the first time, a Down syndrome patient, serving as a volunteer in a military hospital. In Israel, physically handicapped people in wheelchairs could be seen everywhere, but it was the first time for her to see the mentally disabled, which made her feel “very interesting.” After the completion of her military service, she went to the United States as a volunteer to attend a summer camp specifically for the disabilities, where she met many disabled people aged from 3 to 50 and lived with them for 24 hours. Marina started thinking to regard special education as her university major. However, she was also very interested in language learning. Finally, she selected East Asian culture and chose Chinese as language. After graduation, she still wanted to engage in special education and opened her own special education kindergarten in Israel for three years. In August 2014, she received a scholarship from the Chinese government to study Chinese at Renmin University of China and her husband Nadav came to China with her. Nadav was also a social worker in Israel. When he saw the recruitment of Sino-German Handicapped Technology Company for trainer, he submitted a resume. Originally, He thought that this job was in Beijing, it was until he received a phone call that he discovered that it was in Beijing West Road in Taicang City. After interview at Taicang, he decided to accept the job quickly. Now he is the general manager. In the summer of 2015, Marina also came to Sino-German Handicapped Technology Company after graduating from Renmin University of China. 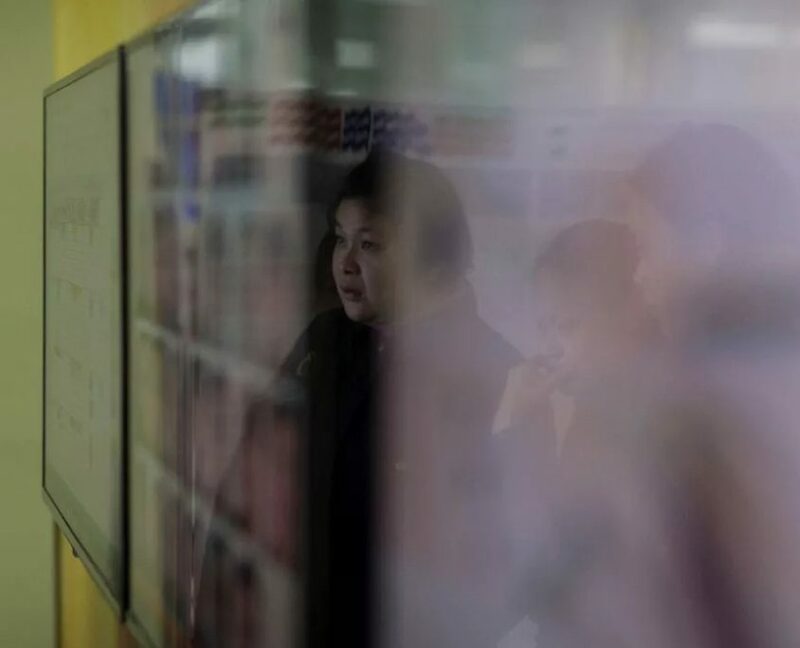 Some parents expressed their suspicion, while some parents also said that they did not care about social security and housing fund as long as their children could get a job. And many people with mental disabilities did not understand the meaning of income. However, Marina believes that this company can provide equal opportunities for those mentally handicapped people, and that the most important thing is not the improvement of work ability, but the change in their lives. After the mentally handicapped go to work, they can take care of themselves and buy gifts for their families on their own, which can also relieve the family pressure. Parents also feel that they are very proud when their children are liked and affirmed by people they do not know. For employees, work is an important part of their lives and sometimes, they are even unwilling to take leaves. Currently, the company’s operation still relies on the pre-investment and fund of German Investment and Development Co., Ltd. However, the company hopes to achieve profitability in 2018 and the plant area will also be expanded at that time. Marina hopes to have more orders to provide more employment opportunities for more people with mental disabilities. Shen Ya said that the support of investment was certainly not unlimited, but the most important thing was to maintain the sound operation of the model through exploration and improvement. In Germany, Lebenshilfe still has half of its funding from government support, while the other half relies on its own profit, but they still maintain the nature of non-governmental organization rather than commercial operation. The employees’ income is calculated on a piece-by-piece basis. However, the purpose of Sino-German Handicapped Technology Company is explore the business model for the employment of the mentally disabilities. “If we can make this project commercialized, we can serve more people” Shen Ya said. The company is trying to extend this model to other cities. Nowadays, people from around the country, companies, or other organizations come to visit almost every day. Sometimes they will receive for several times a day and you can see a “visiting note” at the entrance to the factory. But it is not easy to copy. Di Qing, the production manager of Sino-German Handicapped Technology Company, said that the company relied on more than 200 foreign-funded enterprises in Taicang, local DPF, investors, orders, and German models were all indispensable for support, while these four conditions were not seen in many places. Orders are the biggest problem. Previously, a Shandong enterprise found the company and hoped to help them find orders. “You can imagine, it is very, very difficult” Di Qing said. Some places did not have orders as much as Taicang’s foreign companies, and state-owned enterprises’ quoted processing profits was too low, “maybe profitable only if it is big quantity,” obviously not suitable for this kind of welfare factories. Sino-German Handicapped Technology Company initially had only three customers. They cooperated with them for the consideration of corporate social responsibility. As they guarantee quality and quantity and deliver on time, they gradually get more orders from customers and attract orders from other companies. Currently, the company’s orders are to assemble and process the parts for automobiles and elevators, which have high requirement to quality. Employees are very strict to quality. Sometimes, the trainer thinks that the accessories quality has reached the standard, but the employees still feel that they are not good enough and insist on rework. Marina said that to copy this model can be started from a few tables, chairs, and some simple equipment. When you find a big company for support, you can hire ten people, then you can invest and expand slowly. .
She has a bigger dream. At present, Sino-German Handicapped Technology Company provides disability awareness training and handicapped employee recruitment for enterprises at Taicang and its surrounding areas, together with other organizations. The company also hopes that their employees can have the opportunity to work outside in a converged environment. Awareness training is the first step. Marina said that in Germany, there was no such model of Lebenshilfe factory 60 years ago. Later, there were more awareness and exploration about disability. The second step is to do job match, make enterprises accessible and train employee. After hired, the employee also needs support for a period and guides him to work long-term stability in a converged environment. To promote disabled people’s integration and employment is a common goal of Marina’s colleagues. In their view, this is the only way for disabled people to enjoy equal rights and truly integrate into society. However, in the eyes of Li Suyun, Sino-German Handicapped Technology Company provides a rare place where there is no discrimination. To work outside can hardly avoid being humiliated, and may even encounter bad people, and Teng Xi lacks of resolving power. The key to the problem lies in whether it is possible to create a barrier-free social environment for the disabilities so that they can freely make choices like ordinary people. “Barrier-free society” is a concept that YiRong Consulting and many other disability-related practitioners are devoted to popularizing. “Disabled” generally refers to physical and mental deficiencies which belong to a pluralistic style of a person; and this group of people has obstacles in social communication and interaction because the society does not provide a basic convenience for barrier elimination. In Sino-German Handicapped Technology Company, providing mentally disabled employees with color tool boxes is beneficial to their memory. Each person’s size is attached to the glove-taking machine, and the employee’s food allergy and medication time are recorded on the blackboard in the lounge, which are “basic conveniences” for them. What’s more important is to provide them with job training and continuous attention and guidance in work, life, emotions, and other aspects. Zhou Haibin introduced that this kind of mentally handicapped person’s shelter factory has been matured in Germany, Japan and other countries. The company outsources part of the process to sheltered factories. The disabled receive training in a centralized environment. Production processes will be transformed to optimize the output. At present, China has similar attempts. Previously, the “Sunshine Home Project” jointly implemented by the China Disabled Persons Federation (hereinafter referred to as “CDPF”) and the Ministry of Finance is to provide fostering service for people with intellectual disabilities, mental disorders, and severely disabled persons. However, this kind of shelter is not “employment”. There is no labor contract, let alone production benefits. It just gives money by day. In “Sunshine Home”, mentally disabled people have basically similar work, such as handmade soaps, stringing beads, plastic flowers, etc. Then, they will sell for charity or exhibit, but not enter the market. All costs are borne by the government. “Supportive employment” project after the “Sunshine Home” upgraded is similar to the sheltered factory. In 2015, the “Opinions on the Development of Supportive Employment for People with Disabilities” issued by the China Disabled Persons Federation, united with other eight ministries, like the National Development and Reform Commission, the Ministry of Civil Affairs and son on, asked local governments to gradually develop supportive employment agencies which would organize intellectually disabled persons, mentally handicapped persons and severely handicapped persons who have reached employment age and have the willingness to get employed but difficult to enter the competitive labor market, sign labor contract with the disabilities, purchase social insurance for them and provide them with various benefits so that they can be concentrated for employment in a sheltered environment. However, the key to a sheltered factory system is mobility. Zhou Haibin said that there should be more than one shelter factory, some may focus on manual skills, some may focus on mechanical operation, and some may focus on interpersonal skills, and the mentally handicapped people could flow just like tap water. In Japan and Germany, the employment of the mentally handicapped is followed up by the government’s employment supervisor whose work is to adjust work according to the specific circumstances until he finds that the job could fulfill his potential. At present, the sheltered factories provided by the Chinese government are limited, and there are no supervisor to link the whole system. The disabled often have no choice. If the job is not suitable, the frustration may undermine their confidence in employment. “If there are ten (Sino-German Handicapped Technology Company) in Taicang, then people with disabilities can get training in different places,” Zhou Haibin said. After 6 monthes, there might be one especially suitable for him, this would give him great confidence and this is the significance of the sheltered factory as a complete chain, that is, to make the mental disabilities have a choice. In fact, the system also includes the environment outside the sheltered factory. Integrating employment is a more complicated option. Sino-German Handicapped Technology Company also hopes that employees will be able to work in a converged environment when their abilities improve in sheltered factory and truly integrate into this society. But are society and enterprises ready?